Ryan Christensen’s family developed a nine-hole golf course on 35 acres of unproductive farmland mostly to provide a community service. Yet indirectly, Christensen, 33, said what he’s learned from running the hobby golf course is helping him to improve his farm’s bottom line, and position it to meet future challenges. In 2014, Christensen upgraded the pivot that waters the golf course to variable-rate irrigation – a relatively new technology that allows irrigators to adjust flows from individual nozzles based on varying field conditions. The upgrade allows Christensen to irrigate putting greens, fairways and rough differently. The variable-rate pivot also encompasses 10 acres of alfalfa and a 56-acre farm field that rotates between wheat and potatoes. On that farm ground, Christensen can adjust rates to suit different crops and shut off water when the span passes over the field’s many rock outcroppings, or ground that has already been harvested. Furthermore, he can increase his irrigation rate on ridges and cut volume where water accumulates in depressions, boosting yields and reducing losses to tuber rot in potato rotations. Ryan Christensen with his daughter while working the family farm. Regional irrigation experts emphasize variable-rate technology is labor-intensive and costly, but a few progressive farmers who raise high-value crops – especially potatoes – are starting to realize its benefits can also be impressive, in the right circumstances. All of the major irrigation equipment manufacturers now carry variable-rate products. “I think as more and more farmers are required by watering districts to cut back on their water usage, it’s going to be more and more implemented,” Christensen said. Christensen, working with Brigham Young University plant sciences professor Bryan Hopkins to analyze his data, said he harvested a better wheat crop in 2017, while curbing his water use by a quarter. He hopes to eventually convert half of his farm’s 18 pivots to variable-rate irrigation. Though the decision to invest about $35,000 to convert the initial pivot to variable-rate irrigation was driven by the golf course, Christensen noticed his initial crop of variable-rate irrigated chipping potatoes had significantly less rot. He also equaled his farm’s average for spud yields, though his crop sustained heavy hail damage. The following season, Christensen brought in Hopkins – who had been his professor when he studied landscape management at BYU – to help with the variable-rate analysis. He and Hopkins took 90 soil samples from throughout the field to assess water-holding capacity, which Christensen combined with a historical yield map, a topographical map, moisture sensor readings and images taken from a drone to refine his variable-rate prescription map. That season’s soft white winter wheat crop yielded about 20 percent above normal. Last season’s winter wheat crop yielded nearly 10 percent better. Furthermore, his water consumption dropped dramatically. Under conventional irrigation in winter wheat, he applied a constant water rate of 0.75 inches, equal to 1.149 million gallons of water throughout a full pivot rotation. With variable-rate irrigation, he used 862,500 gallons – good for a savings of roughly 25 percent. Christensen is sure his variable-rate irrigation has been cost-effective, though Hopkins hasn’t finished calculating the exact savings. “Water is a very important resource, and (Hopkins) believes water is very inefficiently used most often,” Christensen said. This spring, Christensen will plant Russet Burbank potatoes under the variable-rate pivot. He hopes to install more variable-rate packages as his finances allow, and as commodity prices begin to rebound, likely locating them on hilly fields. Christensen also needs less herbicide to produce good crops under variable-rate irrigation, given that he’s no longer watering weeds that thrive in rocky outcroppings. “I’ve already started looking at putting them in other locations, if for no other reason than to quit watering rock piles,” he said. Christensen bought his variable-rate equipment from Double M Ag & Irrigation in American Falls, Idaho. Travis Mills, who owns the business – which also has Idaho locations in Blackfoot and Aberdeen – said it was the second system he’d sold. The first system was delivered to BYU-Idaho’s agricultural program in Rexburg. Mills has noticed a recent uptick in grower interest in variable-rate technology. He’s been evaluating variable-rate irrigation as an option for a local farmer’s pivot encompassing both sandy and heavy soils, which require different irrigation rates. In addition to water savings, Mills said variable-rate technology helps growers curb use of fertilizer and pesticides added for chemigation. 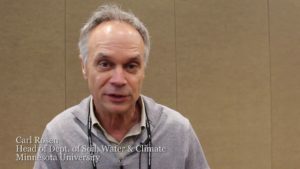 Washington State University Extension irrigation specialist Troy Peters published a bulletin advising farmers about variable-rate irrigation. Peters said it may be a good option in specific circumstances, such as in fields harboring a lot of rock piles that are used to raise high-value crops. But he warns growers that implementing it takes a lot of work and careful irrigation scheduling, and that they may be better off trying simpler and more cost-effective methods of improving their water efficiency. “A lot of the studies I’ve seen show it’s kind of rare circumstances where (variable-rate irrigation) is cost effective,” Peters said. University of Idaho Extension irrigation specialist Howard Neibling will conduct his first variable-rate research in Kimberly, Idaho, this season, using a new system funded by the state’s barley and wheat commissions. Neibling plans to evaluate variable-rate irrigation in conjunction with varying the elevation of spray nozzles. Neibling also advises that the technology involves “complicated electro-mechanical systems,” and longevity could prove to be an issue. But he acknowledges a water savings of up to 25 percent with variable-rate irrigation could afford growers with tight irrigation supplies the flexibility to finish irrigating high-value crops in other fields. Christensen has been fielding an increasing number of calls recently from other growers interested in learning from his experience. He tells growers considering their own experiments with variable-rate irrigation that it requires a considerable time investment and research to write good prescriptions. In-season monitoring and a willingness to constantly tweak their operations is also a must, he said. “I think it’s been worth it,” Christensen said.